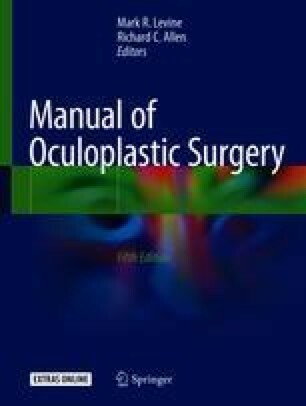 This chapter will follow the concept of the continuum of repair necessary for increasingly larger eyelid defects as discussed in Chap. 35. After the lesion is excised, if the gap is greater than approximately 3 mm when the two edges of the lid are grasped with forceps or skin hooks and pulled together, a repair technique that permits closure of this larger defect must be used. The Tenzel rotational flap, or semicircular flap, proves to be an ideal technique. The semicircular flap can be used for either upper or lower lid reconstruction. It is useful for defects affecting up to 40–50% of the medial or central portion of the eyelid. The online version of this article ( https://doi.org/10.1007/978-3-319-74512-1_36) contains supplementary material, which is available to authorized users.